With fragrance to spare and masses of flowers, Philadelphus Belle Etoile is a mock orange to look for. The flowering time is from mid spring through to summer, and the flowers are a good clean white with flushes of pink in the base. Grown for the flowers and the sweet perfume, as the warmth of summer commences a single plant can provide good perfume for weeks. This is a good sized and strong growing shrub that is best planted where it has room to spread. It does take well to pruning however and we have seen good specimens growing in large containers. Although it is a strong grower, it is naturally compact in its growth habit and requires minimal pruning. The time prune is immediacy after flowering. Simply prune back each flowering stem by around 1/3. This works better than tip pruning. Every few years prune some of the oldest stems right back to the base of the plant. This is a deciduous shrub that will reach around 2 metres in height with a similar spread. As the name suggests, its origins are in France with Pierrre Lemon being the hybridiser. Philadelphus Belle Etoile will grow in most areas of Australia, although it os not suited to tropical climates or very dry hot inland areas. Best grown in full sun to part shade, flowering will be inhibited in heavy shade. A humus rich moist and well drained soil is best and annual applications of a general purpose fertiliser and a layer of mulch will encourage strong growth. We think that Philadelphus Belle Etoile is one of the best Mock Orange varieties for perfume. 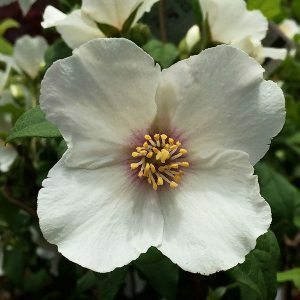 Philadelphus Belle Etoile is available for sale from the following nurseries.